Here's a provision under the Mosaic Law that restricts a man from remarrying a woman after his divorce from her and her subsequent remarriage to another man. It would appear that this law is designed to protect the second marriage from emotions which may be potentially revived between the original marriage partners. This is a bridge-burning law that says, "You can't go back!" What might this "uncleanness" of verse 1 involve? After all, the realization that a Hebrew woman wasn't a virgin after one marries her is dealt with in Deuteronomy 22:13-30 (see notes), and the penalty for this unfaithfulness was stoning to death - no divorce required there. Likewise, death by stoning is the outcome specified for adultery in Numbers 5:11-31 (see notes). However, there are at least a couple of situations that come to mind where a woman taken in marriage may not be a virgin. In Exodus 22:16-17 (see notes) we see a situation where an innocent woman is no longer a virgin. Another scenario might be the woman taken prisoner and subsequently taken as a wife by her Hebrew captor as seen in Deuteronomy 21:10-14 (see notes). In both instances we have the possibility that one might marry a woman who was not a virgin at marriage and become dissatisfied afterward because of the discovered "uncleanness." 6 No man shall take the nether or the upper millstone to pledge: for he taketh a man’s life to pledge. (5) Draft exempt for a year after marriage to "cheer up his wife"
Note also Deuteronomy 20:7 (see notes), "And what man is there that hath betrothed a wife, and hath not taken her? let him go and return unto his house, lest he die in the battle, and another man take her." The millstone was made up of two stones, a really big stone as the base with a small stone of five pounds or so that fit one's hand for the purpose of grinding grain. A poor person depended upon this tool for his food. This tool could not be taken as security for a loan. (7) Death to kidnappers for the purpose of selling them as slaves. Hey! Isn't that how they ended up in Egyptian captivity in the first place after the brothers sold Joseph into slavery? (8-9) Keep the laws regarding leprosy and remember Miriam's bout with it in Numbers 12 (see notes). (10-13) Collateral for a loan cannot be repossessed from the borrower's home; it must be brought out. If a poor man's basic cloak which he uses as his night clothing is used as collateral, it must be returned before nightfall. (14-15) The poor man must be paid his wages at the end of every day he works. (16) You can only be executed for your own sin - not the sin of a father or child. (17-18) The legal rights of the foreigner and the poor person must be protected. (19-22) Leave something in the field after the harvest for foreigners and poor people to glean. While the Hebrews were the covenant people (their relationship with God), it is interesting to note the provisions made in the Law of Moses for foreigners. Notice verses 17, 18, 20 and 21. As a matter of fact, notice Deuteronomy 10:19 (see notes), "Love ye therefore the stranger: for ye were strangers in the land of Egypt." This generosity stopped short, however, of ever being king over Israelites (Deuteronomy 17:15, see notes), and a Hebrew COULD charge interest on a loan to a stranger, but NOT a fellow Hebrew (Deuteronomy 23:20, see notes). Another interesting provision for the foreigner living among the Hebrews was that he could be given certain foods to eat that were unclean to the Hebrews and forbidden (Deuteronomy 14:21, see notes). A beatin' has an upper limit of 40 whacks. I guess that's some consolation. Rabbis in the first century decreed 39 stripes instead of 40; they wanted to be certain there was a margin for error so as to not exceed the letter of the law in case of a miscount. The Apostle Paul was so beaten five times according to his own words in II Corinthians 11:24 (see notes), "Of the Jews five times received I forty stripes save one." In the case of these Law-prescribed beatings, the judge was to oversee the beating as the beatee was to lie, face down, on the ground for the punishment. Paul makes reference to this verse when talking about preachers getting paid in I Timothy 5:18 (see notes), "For the scripture saith, Thou shalt not muzzle the ox that treadeth out the corn. And, The labourer is worthy of his reward." Paul also quotes this verse in I Corinthians 9:9 (see notes), "For it is written in the law of Moses, Thou shalt not muzzle the mouth of the ox that treadeth out the corn. Doth God take care for oxen?" 7 And if the man like not to take his brother’s wife, then let his brother’s wife go up to the gate unto the elders, and say, My husband’s brother refuseth to raise up unto his brother a name in Israel, he will not perform the duty of my husband’s brother. 9 Then shall his brother’s wife come unto him in the presence of the elders, and loose his shoe from off his foot, and spit in his face, and shall answer and say, So shall it be done unto that man that will not build up his brother’s house. In Israel, it was your family obligation after your brother's untimely death to take his wife and give her an opportunity to bear a child. So, you refuse? Better get ready for some public humiliation then...in front of the whole city. The dead brother's name would be continued through the birth of the son conceived under this provision of the Law. This procedure was not new under Mosaic Law. We first get a glimpse of this brotherly responsibility in Genesis 38 (see notes) with Judah and his first son, Er. We then see this scenario played out between Ruth and Boaz in the Book of Ruth (see notes). Some have sought to make this law socially compatible with contemporary standards by specifying that the obligation existed only when the brother had not previously married prior to his brother's death. There is no scriptural evidence to support this notion. In fact, providing an heir was the issue here. The widow needed an heir for her dead husband, and the remaining brother was obligated to provide that heir in his brother's name - without regard to the one or more wives he might already have. In Hebrew culture, marriages under these circumstances are known as "levirate" marriages. A property-rights issue is probably in view here. If a widow without children marries outside of her husband's clan, that portion of the family inheritance of land may end up in the hands of another clan. This insures that the property stays where it was intended. Incidentally, the special circumstances of this law overrides the stipulations of Leviticus 18:16 (see notes) and Leviticus 20:21 (see notes). Both of those passages forbid one from marrying his brother's wife. Jesus touches on the provisions of this law when asked a question by the Sadducees (Matthew 22:23-33; Mark 12:18-27; Luke 20:27-40 - see notes). Ouch! A wife can lose a hand by coming to the aid of her husband in a fight...if she's not careful. Punch, kick, bite, scratch if she likes, but she must be careful about the bodily location of her aggression. Inaccurate scales are illegal, and it's illegal to cheat someone by deliberately falsely weighing the product. Interesting...consumer protection laws even back then. Specifically, if one were buying, he might have pulled out a heavier weight to balance it on his scales against the product he was purchasing - getting more for his money. On the other hand, if he were selling, he might pull out the lesser weight against which he balanced the product, thus giving less product for the purchase price. That was illegal under Mosaic Law. The Amalekites...they hate us, and we're not crazy about them. Remember when God judged Israel for refusing to go take Canaan after the return of the 12 spies in Numbers 14. They decided to try to reverse God's judgment by going up against the Amalekites into Canaan by their own might and were thoroughly whipped in battle (Number 14:39-45, see notes). However, the reference here looks back to their immediate exodus from Egypt when the Amalekites dogged them in Exodus 17:8-13 (see notes). That was Israel's first big battle, and they prevailed. But wait! That's still not enough! This revives under Saul in I Samuel 15 (see notes) when he goes after the Amalekites...and he's motivated by this very command. According to the Jewish Study Bible, "These verses are read liturgically on the Sabbath before Purim, since according to Jewish tradition, Haman, the evil protagonist of Esther, is an Amalekite (see 1 Sam. 15:8 and Esth. 8:3)." 2 That thou shalt take of the first of all the fruit of the earth, which thou shalt bring of thy land that the LORD thy God giveth thee, and shalt put it in a basket, and shalt go unto the place which the LORD thy God shall choose to place his name there. 3 And thou shalt go unto the priest that shall be in those days, and say unto him, I profess this day unto the LORD thy God, that I am come unto the country which the LORD sware unto our fathers for to give us. 4 And the priest shall take the basket out of thine hand, and set it down before the altar of the LORD thy God. 9 And he hath brought us into this place, and hath given us this land, even a land that floweth with milk and honey. 11 And thou shalt rejoice in every good thing which the LORD thy God hath given unto thee, and unto thine house, thou, and the Levite, and the stranger that is among you. 14 I have not eaten thereof in my mourning, neither have I taken away ought thereof for any unclean use, nor given ought thereof for the dead: but I have hearkened to the voice of the LORD my God, and have done according to all that thou hast commanded me. 15 Look down from thy holy habitation, from heaven, and bless thy people Israel, and the land which thou hast given us, as thou swarest unto our fathers, a land that floweth with milk and honey. They were not to just take their offerings and leave - had to recite to the officiating priest the history lesson of their people going back to Jacob, the Aramean/Syrian (verses 5-9). This all took place back at the location of the tabernacle. Every third year the tithe was taken and given for the provision of the poor and Levites (verse 12) - probably not taken to the central location of the tabernacle, but to a place designated by each tribe. There was a ritual saying that went with this offering as well (verses 13-15) which offered a commitment to God and expressed thankfulness for his provisions. Again, notice that this was a mandatory tithe which, in effect, was how the government provided for the needs of their government servants and poor. For more on this every-third-year tithe, see the notes on Deuteronomy 14:22-29. 16 This day the LORD thy God hath commanded thee to do these statutes and judgments: thou shalt therefore keep and do them with all thine heart, and with all thy soul. 19 And to make thee high above all nations which he hath made, in praise, and in name, and in honour; and that thou mayest be an holy people unto the LORD thy God, as he hath spoken. The second giving of the Law is now complete. These four verses cap it off with an exhortation to adhere carefully to the stipulations of the covenant the Lord has established with the Hebrews. The special status of the Hebrew people before God is once again stated in these verses. 1 And Moses with the elders of Israel commanded the people, saying, Keep all the commandments which I command you this day. 3 And thou shalt write upon them all the words of this law, when thou art passed over, that thou mayest go in unto the land which the LORD thy God giveth thee, a land that floweth with milk and honey; as the LORD God of thy fathers hath promised thee. 4 Therefore it shall be when ye be gone over Jordan, that ye shall set up these stones, which I command you this day, in mount Ebal, and thou shalt plaister them with plaister. 5 And there shalt thou build an altar unto the LORD thy God, an altar of stones: thou shalt not lift up any iron tool upon them. 7 And thou shalt offer peace offerings, and shalt eat there, and rejoice before the LORD thy God. 8 And thou shalt write upon the stones all the words of this law very plainly. 9 And Moses and the priests the Levites spake unto all Israel, saying, Take heed, and hearken, O Israel; this day thou art become the people of the LORD thy God. 10 Thou shalt therefore obey the voice of the LORD thy God, and do his commandments and his statutes, which I command thee this day. 13 And these shall stand upon mount Ebal to curse; Reuben, Gad, and Asher, and Zebulun, Dan, and Naphtali. 16 Cursed be he that setteth light by his father or his mother. And all the people shall say, Amen. 17 Cursed be he that removeth his neighbour’s landmark. And all the people shall say, Amen. 18 Cursed be he that maketh the blind to wander out of the way. And all the people shall say, Amen. 19 Cursed be he that perverteth the judgment of the stranger, fatherless, and widow. And all the people shall say, Amen. 20 Cursed be he that lieth with his father’s wife; because he uncovereth his father’s skirt. And all the people shall say, Amen. 21 Cursed be he that lieth with any manner of beast. And all the people shall say, Amen. 22 Cursed be he that lieth with his sister, the daughter of his father, or the daughter of his mother. And all the people shall say, Amen. 23 Cursed be he that lieth with his mother in law. And all the people shall say, Amen. 24 Cursed be he that smiteth his neighbour secretly. And all the people shall say, Amen. 25 Cursed be he that taketh reward to slay an innocent person. And all the people shall say, Amen. 26 Cursed be he that confirmeth not all the words of this law to do them. And all the people shall say, Amen. Remember the Gerizim/Ebal (see map) service we talked about in Deuteronomy 11 (see notes) with 2,000,000+ Hebrews shouting their acceptance of the cursings and blessings of the law? Here are some more specific instructions about how this event is to take place, which doesn't actually happen until Joshua 8. Hey! Be patient; it takes time to put together a 2,000,000-voice choir. The actual event takes place in Joshua 8:29-35 (see notes). It'll be an earth-shaking vocal experience! The advance team will write "all the words of this law" (verse 3) upon stones on the other side of Jordan before this big event. 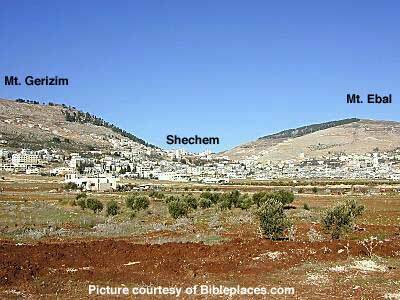 These two mountain tops are about one mile apart over on the Canaan side of the Jordan River. 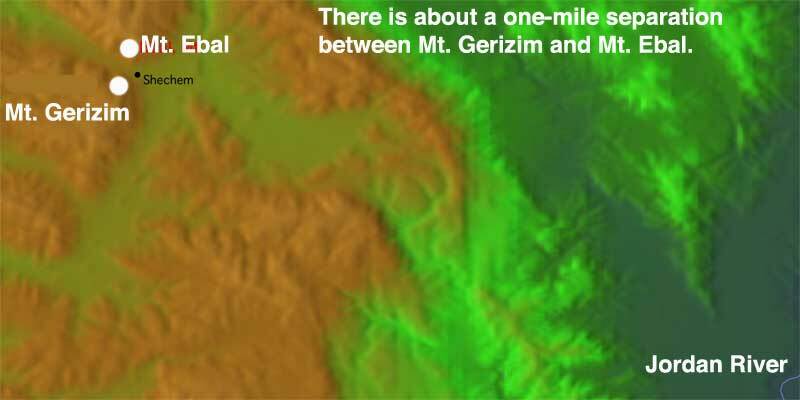 Half of the Hebrew tribes will stand on Mount Ebal (Reuben, Gad, and Asher, and Zebulun, Dan, and Naphtali); the other half will stand on Mount Gerizim (Simeon, and Levi, and Judah, and Issachar, and Joseph, and Benjamin:). The Levites will read the curses, and the people on the mountains will cry "amen." Verses 15-26 list those curses which are to be read at that big gathering. We'll see the reading of the blessings with additional curses in Deuteronomy 28 (see notes).